How: Reserve your seat here! About Innovation Thursday: On August 15th, forward leaning individuals are invited to join for a Thursday evening filled with innovation, disruption, game-changing, revolutionizing, focus grouping, creativity insourcing, product development acceleration, net casting, bootstrapping, design sprinting, networking, problem solving, succeeding though failing, and quality cheap beer. With dynamic PowerPoint slides and the occasional guest speaker, YD Industries moderator Steve Musselman will guide participants through the YD Industries developed products, techniques and methodologies designed to ignite the inner innovator. It’s fun, exciting, and will fundamentally change the world. 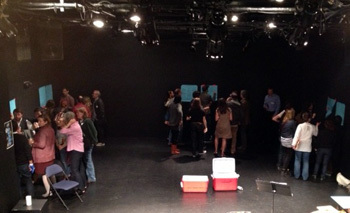 Innovators at a recent YDI focus group gather in dynamic break-out groups around the Schlitz coolers. About YD Industries Events: YD Industries’ stated mission is to impact lives around the globe and, as a result, the corporation has engaged in an aggressive public education campaign through a series of rule breaking live events. Most recently, YDI has been awarding YDIIIGs (YD Industries Innovation Igniter Grants) to innovative performance concerns such as San Francisco’s performance arts collective, Z Space. The gift provides Z Space with the resources and support required to foster internal innovation under the tutelage of YD Industries trained corporate thought leaders. The Innovation Evenings are one of the exciting outgrowths of the YDI & Z Space synergy, and both parties look forward to inviting the public at large to a seat at the innovation table! So, pull up a chair! Strobe lights will not be in use for this event.